Inspired by the aesthetics of the 1920’s-1950’s. 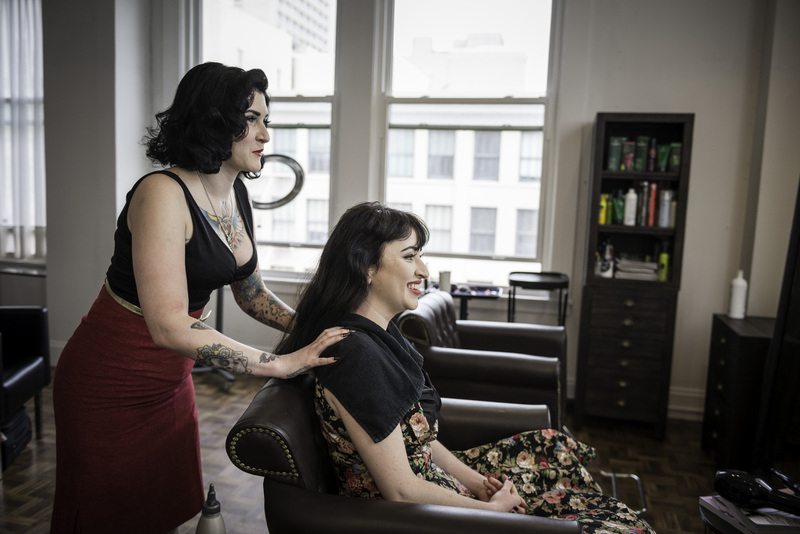 With over 14+ years of professional experience, I have trained in expert hair cutting, coloring, styling, and makeup skills to compliment my clients ever changing styling needs . I enjoy creating a variety of looks ranging from classic to modern, creating styles that compliment each client’s personality, lifestyle and facial structure so that their unique beauty can emerge. Believing that great hair has soul. Every women loves the glamorous look of yester year, and every man with there own classic styling intentions. I am trained with the original techniques as well as faster modern ways, from the Victorian age through deco, and beyond. Along with modern styles I can confidently produce exquisite technically sound haircuts on both men and women, and enjoy teaching how to use products to favor your styling needs. Color is also a passion, bombshell blondes, fiery redheads, and seductive brunettes, letting the inner vixen shine bright. My portfolio speaks the language of dedication, hard work, and high levels of a precise cosmetology creative, and overall skill. I have worked along side fashion designers producing there look books for fashion seasons, celebrity clients getting ready for there close ups, tours, and stage performances. So come on in and trust in me to make you feel and look your very best.